Another meme-tastic film with something to say about internet consumption is Disney’s delightful sequel to the 2012 animated-adventure Wreck-It-Ralph, Ralph Breaks the Internet. Kicking off six years after the events of the first film, Ralph Breaks the Internet follows two arcade video game characters, Ralph and Vanellope (John C. Reilly and Sarah Silverman reprising their roles), venturing into the internet to retrieve an item that will restore the arcade. It is when the two land in the internet where the nature of friendship is explored as Ralph, who finds comfort in his routine, is contrasted by Vanellope’s desire to go off the beaten track. Powered with the same source of energy that fuels an arcade, the friendship between Ralph and Vanellope is electric with praise ought to be given to the performances of Reilly and Silverman. Whether it be playing I Spy, discussing if certain video game characters wax or making an in-jest comment about each other’s hygiene, the dialogue between the two is crafted with charm and love. Wreck-It-Ralph screenwriter Phil Johnston and director Rich Moore co-direct the film together with other unlockable characters including Gal Gadot’s tough but kind Shank, Taraji P. Henson’s shimmering-blue Yesss, pop-up ad J.P. Spamley (Bill Hader) and now married stars of the first film Fix-It Felix Jr. (Jack McBrayer) and Sergeant Calhoun (Jane Lynch). Ralph Breaks the Internet explores how toxic internet culture can be, and the negative impact this has not only on people’s sense of self but also on their relationships. ‘Breaking the internet’ works on two levels as both a plot point which shows Ralph finding value by being what people want him to be online and in the film’s climax which depicts the destructive depths people go to avoid loneliness. The film is not entirely dreary, with jokes at the expense of the internet being populated throughout and include a search bar consultant whose auto-fill function interrupts anyone that talks, annoying pop-up ads that resemble Inside Out (2015) characters and jabs at individuals’ stalkerish behaviour. 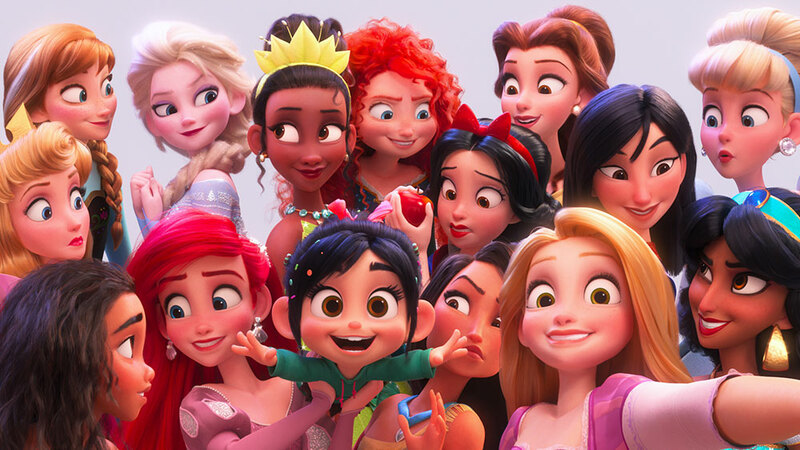 In a move that is sure to sell a million t-shirts, the inclusion of the Disney Princesses as characters will be enough to sell this film and inevitably launch new franchises. Quick to call out their tropes, their influence on Vanellope encourages her to find her calling in the most quintessential, yet unexpectedly hilarious, Disney way. Despite their inclusion, there is another unexpected cameo which packs an emotional punch and sure to tug at the heartstrings of Disney fans. Anything goes when a film is set in the internet with the likes of The Matrix (1999) and Ready Player One (2018) creating dynamic, expansive universes. Unfortunately, Ralph Breaks the Internet suffers in terms of this sense of world building with many of the locations looking like the inside of a building or an excerpt from The Emoji Movie (2017). The setting of Slaughter Race, a self-described lawless car-ballet wasteland, is the only exception to this with the barren colours being a long way away from the bubblegum hues of Sugar Rush. The inclusion of many well-known websites as destinations in the film grounds Ralph Breaks the Internet in today, while also letting the audience point to the screen and have ‘it’s Facebook!’ moments. The film speaks to the consumption of the masses in a way that is self-referential but also self-aware. Ralph is a passenger of this subtext which sees the film work as a series of on-going consequential events that drive the plot as opposed to an organic narrative. Because of this, moments of action are sparse with a greater focus being placed on relationship development, which may cause younger cinema-goers to play on their parents’ phones in between scenes. 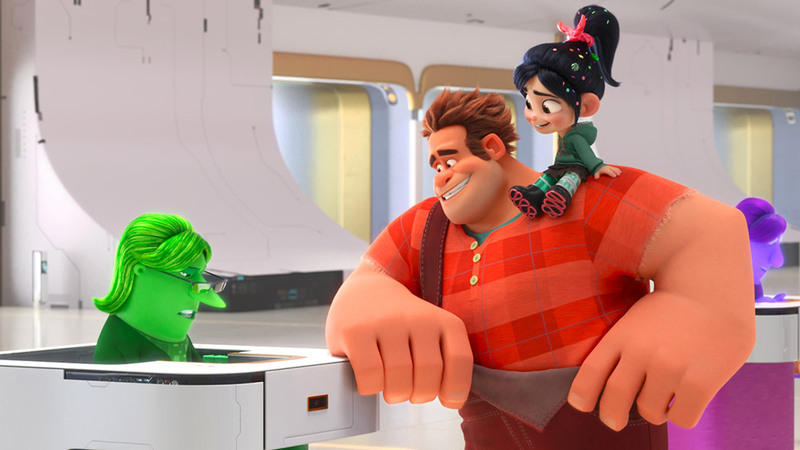 Big risks are taken in the resolution of the film with Ralph and Vanellope – whose friendship was forged over feelings of mutual marginalisation and preventing the destruction of Vanellope’s home – levelling up from where they started in Wreck-It-Ralph. Cats, flossing, makeup tutorials, food shaped like celebrities and all, Ralph Breaks the Internet embraces the viral sensations which occupy our screens right now, with Ralph and Vanellope sure to win over crowds in this profoundly fun entry from Disney.